Brian Joseph Muno. October 29, 1960-May 20, 2018, suddenly. Loving son of Mary B. and the late William C. Muno. Dear brother of William II (Nanette) Muno, Kelly Ann (Jerry) Gust, and Kerry Ann (Sean) Toomey. Adored uncle of Ali and Bo Muno, Patrick, Nicholas and Caroline Gust, Grace, Maggie, Sarah and Will Toomey, long time partner of Mary Lou Wattman. 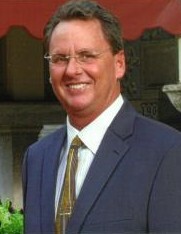 Brian was a graduate of Maine South High School in 1979 and the University of Notre Dame in 1983. He was a member of the Chicago Merchantile Exchange where he was a commodity trader since 1983. Visitation Tuesday, May 29, from 4-8 p.m., at Ryan-Parke Funeral Home, 120 S. Northwest Hwy. (2 blks S. of Touhy), Park Ridge. A prayer service will be held on Wednesday, May 30, 11 a.m., at St. Paul of the Cross Church, 140 S. Northwest Hwy., Park Ridge. Interment will be private. In lieu of flowers, memorials to the Evans Scholars Foundation, www.wgaesf.org, are appreciated.